Like many other New England states, Connecticut has a small amount of placer gold. Litchfield County in the northwestern part of the state has the most known occurrences, with nearly all gold being small glacial deposits. Above the Thomaston Dam at Leadmine brook are documented gold discoveries, as well as the Farmington River northwest of Hartford. Spruce brook also has reports of minor placer gold deposits. Glacial gold deposits found in Connecticut are the source for most of the gold found in the state, and the vast majority will be fine dust and flakes, rather than big nuggets that you might hope to find in Alaska or California. Most reports from prospectors in Connecticut show that panning for several hours might produce a few "colors" if you are in a known gold bearing area. 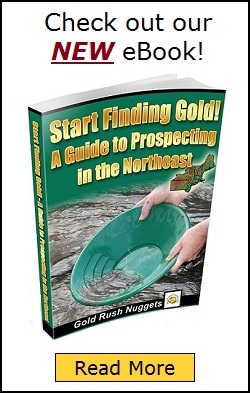 Prospectors in Connecticut may also want to investigate nearby states such as Vermont and Maine, which are not too far away, but may be worth the effort to try and find richer gold bearing areas. As always, be respectful of private property rights. Ask permission before doing any prospecting on private lands, and follow the rules and regulations for mining in whichever state you mine in. While most states allow gold panning, if you intend to use larger equipment such as highbankers, sluice boxes, or suction dredges, there are likely to be certain restrictions in place. Whether they are seasonal or size limitations. When you find an area that you think has good potential for holding some gold, be sure to understand how and where to look. Since gold is the heaviest element that you will find in a stream, it can be somewhat predictable in how it get deposited. Areas on the inside bends of curves, slack water areas behind large boulders, and deep down at the bedrock are the gravels that you want to pan. Gold in Connecticut is not widespread, so be sure to do your research to increase your odds of success.